Safety FirstWhen used correctly with the appropriate safety measures in place, inflatables make a great outdoor activity for parties and summer events. Inflatable installers and operators need to take some necessary precautions to make sure everyone has a fun, injury-free time. Never set up an inflatable on a slope. Look for a flat area at least five feet larger than the inflatable. A tarp should be put on the ground to protect the inflatable before installation. Inflatables should always be staked in the ground or have weighted bags securing them into place, and when inflated there should be no sagging material anywhere. 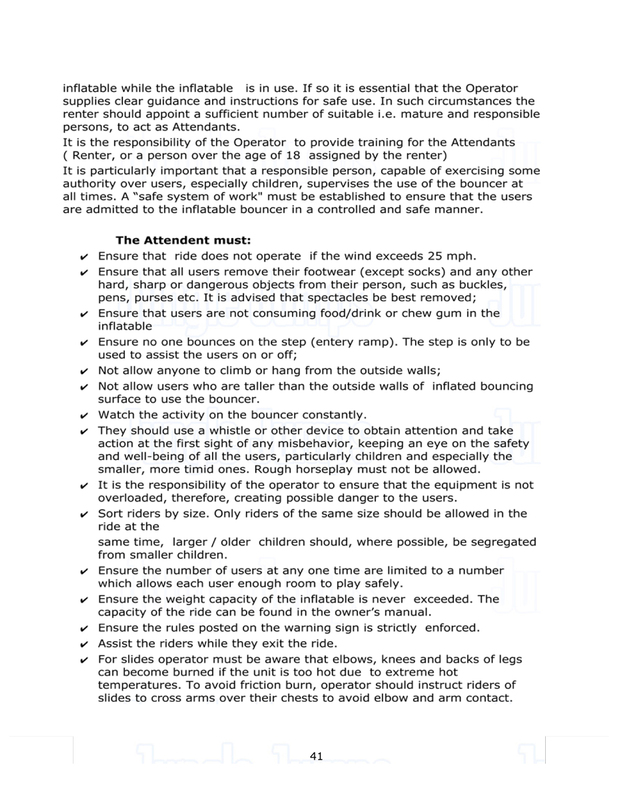 Whether your services include an attendant or if the guests will be in charge, inflatable users should always be instructed on safety guidelines for using the product. A good rule of thumb is to visibly post the operating and safety instructions, while also giving the operator a verbal understanding of this. An occupied inflatable should be attended by an adult at all times. Children under age three should never be allowed in a full-size inflatable. Children entering the inflatable should be grouped according to size to reduce the risk of injury to their peers. Never exceed the maximum ride capacity. The inflatable should be turned off immediately in the case of inclement weather or high winds. It is imperative that you keep your products in tip-top condition. Make sure there are no tears, holes or other damage done on the product before each use. Always properly clean and sanitize inflatables. This will not only keep your customers germ-free, but also present a positive image of your services. For more information on inflatables safety tips click below for the Safe Inflatable Operators Training Organization.http://sioto.org/The most common inflatable accidents to watch for are multiple people collisions, particularly when there is a large size difference between the children, falling out of a jumping balloon or off of an inflatable slide, catching a body part in the inflatable while others are jumping, wind gusts blowing over an unsecured inflatable, and rapid deflation causing children to fall to the ground.When used properly, inflatable injuries are few and far between. According to the CSPC (The Consumer Product Safety Commission) there were only 489 injuries in 2004 for ALL amusement park rides. To query additional data and for more information visit the National Electronic Injury Surveillance System (NEISS) below.http://www.cpsc.gov/library/neiss.htmlThe majority of injuries and accidents occurring as a result of inflatables can easily be avoided by following these simple safety procedures. Most of the injuries occur as a result of inadequate supervision and equipment failure due to improper set-up. Both of which are easily avoidable. When caution is taken, inflatables are no more risky or accident-prone than the neighborhood pool. When you install, set up, and use inflatables, keep in mind several precautions: • Never leave children unattended• Observe WARNING LABEL• Keep the unit away from heat and open flame. The material can burn and melt, ruining the inflatable, and also causing deflation, which can cause injury.